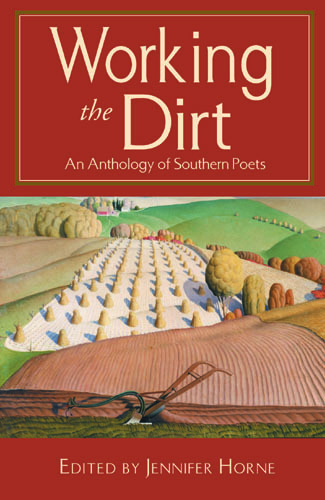 The talented poet and editor who gave NewSouth Books Working the Dirt, its highly praised anthology of Southern verse, admits she didn’t always have her hands in Southern soil. Authors’ site Red Room recently featured her blog entry, “Is I is or Is I ain’t a Southerner?” Red Room is a “social hub,” a site where one can buy books, connect with authors and book lovers, and find content written by “many of the world’s greatest writers,” both published and unpublished. As Horne asks, “Is I is or Is I ain’t a Southerner?” She finds that she fits the bill because she says “fixin’ to” and once requested a skillet for her birthday. However, she’s never “chopped cotton or killed a hog.” Horne wonders if the very act of questioning her Southernness is in itself a sign of being Southern. Online literary journal Southern Women’s Review, which showcases works by Southerners or Southern transplants, also selected Horne’s short story “Business or Pleasure” (found on page 28). “Business or Pleasure” is a brief but powerful piece about a lawyer who ventures out of her comfort zone one night in a hotel. The intelligent, relatable heroine is forced to examine what roles choice and chance play in her life. Working the Dirt is available from NewSouth Books, Amazon.com, or your favorite online or retail bookseller. Ken Robbins has been busy writing and editing lately and making news. Robbins is the author of a NewSouth-published novel called The City of Churches, a fictional account of two men whose lives were forever changed by a civil rights-related church bombing in a story inspired by real events that happened at the Sixteenth Street Church in Birmingham, Alabama, in 1963. Recently, Robbins’s play In The River has been performed in Washington, D.C., as part of the Source Theatre Festival and was selected for publication in “Literary Laundry,” an online journal published out of Stanford University. … “In the River” by Ken Robbins, directed by Mellissa-Leigh Bustamante and Kjerstin Lysne, is the most mesmerizing piece I’ve seen that covers disturbing cultural alliances fueled by ancient tribal hatreds, within a Slovak and middle eastern context, that is so experiential it almost defies description. It is exquisitely performed by Robert Bromley as the Fisherman and Kelly Mayfield as the River with couplets of characters offering asides, commentary and observations, and an emotional impact that must be seen to be believed. Robbins also had his essay “The Healing Power of Butoh” published by Cambridge Scholars Press as a segment in Performing Consciousness. In addition, Robbins and his wife, Dorothy Dodge Robbins, edited Christmas Stories from Ohio, newly published last year by Kent State University Press. The book was honored as the Book of the Year for Literary Anthologies by USABookNews.com. 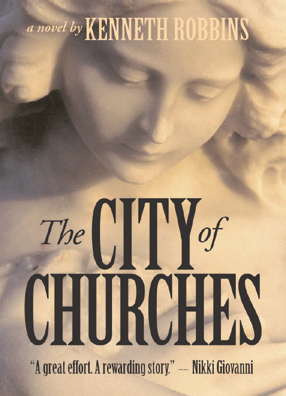 The City of Churches is available from NewSouth Books, Amazon.com or your favorite retail or online bookseller. 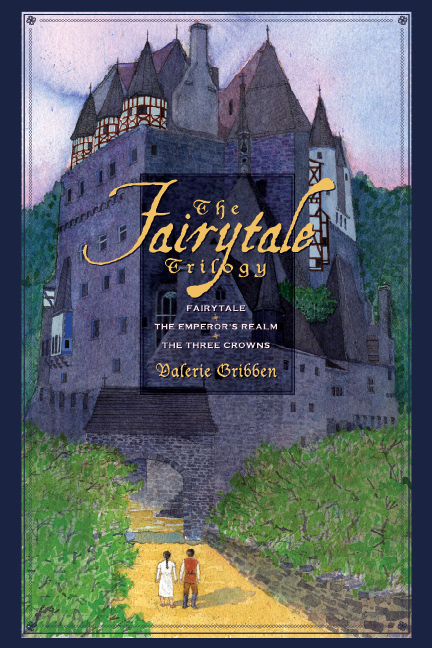 NewSouth is pleased to announce two upcoming events celebrating the release of Valerie Gribben’s newest novel The Fairytale Trilogy. On her Fairytale Market blog, Valerie says that she has a special surprise for the first ten people who buy her book: they’ll get a copy of her first novel, Fairytale, for free! Valerie Gribben, a UAB medical student and author, signs copies of her latest novel, The Fairytale Trilogy, which chronicle the adventures of Marianne and her brother Robin as they come of age in an enchanted land where frogs talk, fantastical creatures prowl, and danger doesn’t stop at the edge of a dark forest. Friday, February 25 from 5-8 PM at the Little Professor Bookstore in Birmingham. Details: 205-870-7461, http://www.littleprofessorhomewood.com/, or www.facebook.com/fairytaletrilogy. Saturday, February 26 from 2-4 PM at Capitol Book and News in Montgomery. Details: 334-265-1473, http://www.capitolbook.com/, or www.facebook.com/fairytaletrilogy. The Fairytale Trilogy is available from NewSouth Books, Amazon.com or your favorite retail or online bookseller. For the second year in a row, a NewSouth Books author was named to receive the Clarence Cason Award, presented by the journalism department of the University of Alabama’s College of Communication and Information Sciences. The award recognizes exemplary non-fiction over a long career. Rheta Grimsley Johnson was last year’s award-winner. This year, the honor goes to Clyde Bolton, who’s had a distinguished 46-year career as a newspaper journalist and is the author of many fine works of non-fiction, including most recently a memoir published by NewSouth, called Hadacol Days: A Southern Boyhood, and also Stop the Presses (So I Can Get Off). The Clarence Cason Award announcement follows several recent articles praising Bolton, his illustrious career, and the charm of his latest memoir. As the Daily Home observes, Hadacol — an elixir of 12% alcohol that was supposed to cure anything — isn’t around anymore, but thankfully gifted writers like Bolton are here to remember the popularity of the concoction among high school kids. Bolton has been honored repeatedly for his work, including by the Associated Press. He has also received the All-American Football Foundation’s Lifetime Achievement Award, is three-time Alabama Sports Columnist of the Year, and in 2001 he was inducted into the Alabama Sports Writers Hall of Fame. The Clarence Cason award is the crowning achievement in a distinguished career of journalism and fiction and non-fiction writing. Tickets for the dinner honoring Bolton are $60. The event will begin with a 6 p.m. reception. Bolton will accept the award and speak at the dinner. To order tickets, phone Sheila Davis at 205/348-4787. 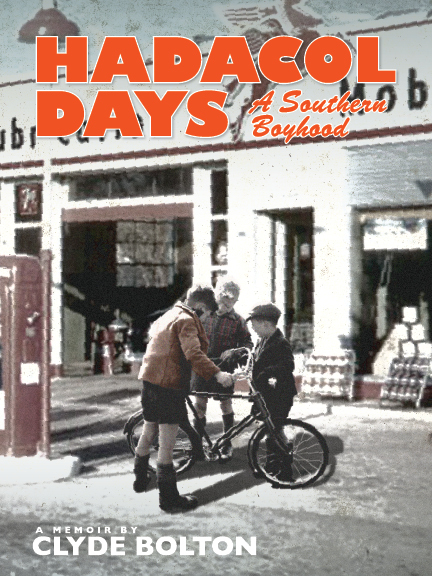 Hadacol Days is available from NewSouth Books, Amazon.com, or your favorite retail or online bookseller. Julie Williams had an exciting day when she was granted membership to the First Flight Society. The society, which seeks to memorialize the Wright Brothers’ accomplishments and promote aviation, inducted Williams, author of Wings of Opportunity: The Wright Brothers in Montgomery, Alabama, 1910, at a recent organization event. 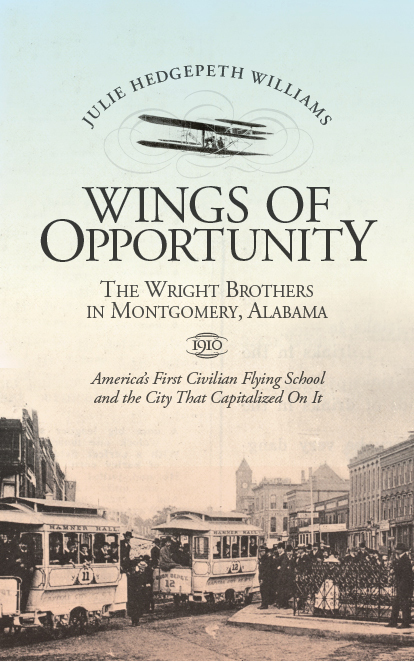 I have been honored this week with a membership in the First Flight Society in connection with my work on the Wright Brothers in Alabama, as shown in my book, Wings of Opportunity: The Wright Brothers in Montgomery, Alabama, 1910. I was invited to speak about the Wright Brothers in Alabama on the 107th anniversary of the first flight, made by Wilbur and Orville Wright in 1903 at Kitty Hawk, NC. In fact, I spoke to the Society at Kitty Hawk. Julie and Wings of Opportunity were also mentioned on Birmingham Fox 6’s Good Day, Alabama morning show. Susan Swagler of Birmingham Magazine and the Turn the Page blog named Wings of Opportunity a recommended read about an unknown chapter in Alabama’s aviation history. Wings of Opportunity: The Wright Brothers in Montgomery, Alabama, 1910 is available from NewSouth Books, Amazon.com or your favorite retail or online bookseller. April 19, 2011 marks the 50th anniversary of the Bay of Pigs invasion. 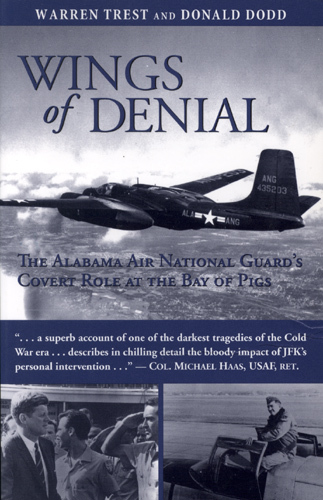 In connection with the anniversary, NewSouth Books has reissued Wings of Denial: The Alabama Air National Guard’s Covert Role at the Bay of Pigs by Warren Trest and Don Dodd. Told within the larger story of bureaucratic bungling and indecision at the highest levels in Washington, Wings of Denial is a tribute to a group of unsung Alabama heroes — Air National Guard volunteers who trained the Cuban freedom fighters and then flew into combat in a desperate attempt to save them when the CIA-backed invasion failed. Four of the guardsmen made the ultimate sacrifice, a closely guarded secret these many years. This is their story. Warren Trest and former Alabama Governor John Patterson, who was governor at the time of the Bay of Pigs incident, will be speaking throughout the year commemorating the events of April 1961. Among other engagements, they are the guest speakers at the Alabama Department of Archives and History ArchiTreats lunchtime program on April 19th. Wings of Denial is available from NewSouth Books, Amazon.com or your favorite online or retail bookseller. Browse our website to learn about our company and titles, and for discussions of Southern news, the book publishing industry, writing tips, and independent bookselling. You are currently browsing the NewSouth Books weblog archives for February, 2011. Copyright © NewSouth Books - Entries (RSS) and Comments (RSS).